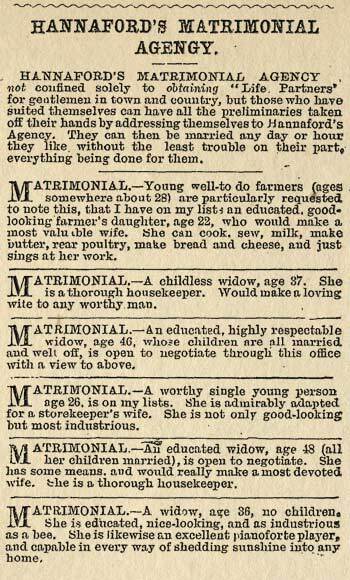 Hannaford's Matrimonial Agency not only offered to put 'gentlemen' in touch with women who were looking for marriage partners, but also to arrange their weddings on 'any day or hour they like without the least trouble on their part'. This small business, established in 1868, combined the services of a marriage bureau and a 21st-century wedding-planning business. The women advertised as looking for husbands ranged in age from 22 to 48. Their educational achievements and cultural accomplishments were highlighted, but most emphasis was given to their practical skills as housekeepers, their industry and their 'sunny' dispositions. These women's material well-being probably rested heavily on their finding husbands with farms, viable businesses or regular earnings.